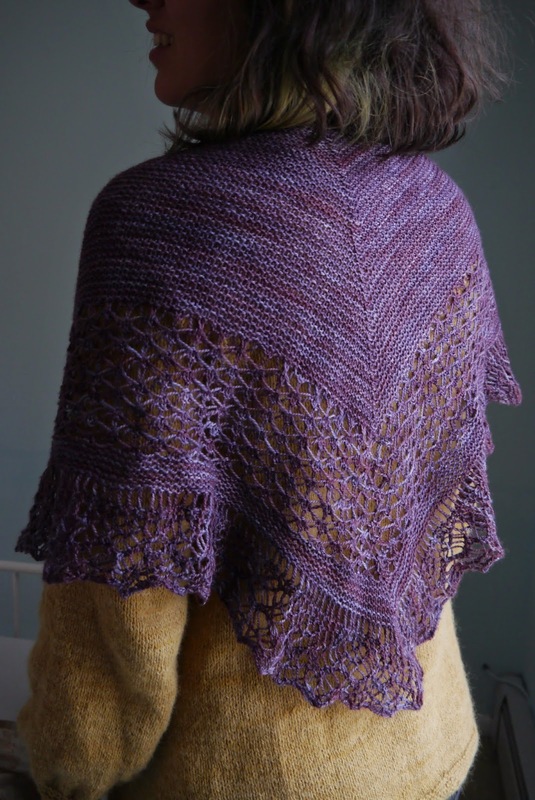 I have craved Jared Flood's Rock Island since it came out, and I even used my very favorite yarn in my very favorite color for it (Sliver Moon Farm's Smoky Plum, now perhaps sadly lost with Kay ten Kraft). And it's lovely though clearly I need to get blocking wires--how did they get the garter to stretch so much that it took looks like lace? I loved the bottom-up construction so that by the time I got to all that garter I was actually sort of glad for the break--I used to be a fairly good lace knitter; I could memorize the pattern quickly and even tink back as needed, but there are a number of snarls that are really visible to no one but me but I know they're there and they will bother me forever. It is still lovely, though. I've been knitting more scarfy-shawlettes lately, the kind I can wrap around my neck but still feel extra fancy. This isn't really one of those, and I find myself wearing it like a regular shawl, which I never do unless I'm at a wedding or something.